Last night was one of those rare occasions where both sets of parents were visiting (Ted's parents are in town for the Christmas and my parents were driving through town on their way to Pittsburgh to visit with my sister and her family). 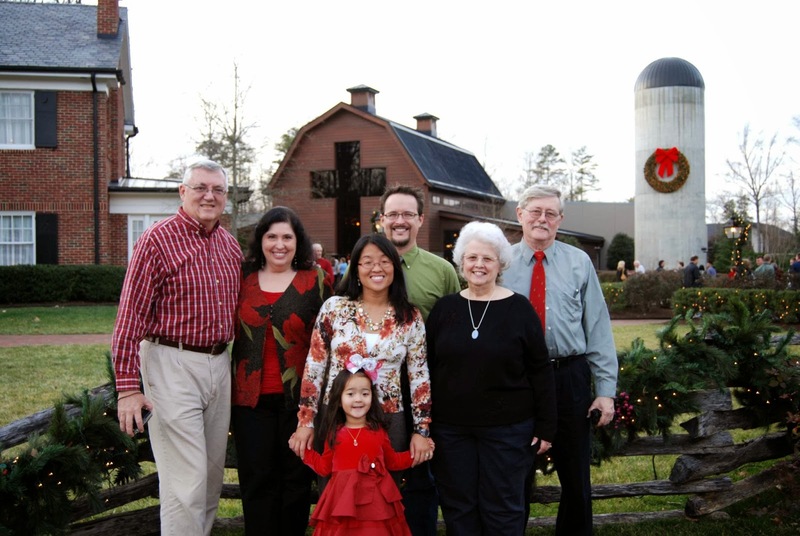 It also happened to be the last night of the Billy Graham Library, Christmas at the Library celebration for 2013. So, we decided to combine families and tradition and go to the Library and have Christmas dinner (a little early). After last year's long wait to just get into the parking lot, we made sure to leave extra early in order to be there in time for our 6PM dinner reservation. As luck would have it, we ended up getting to the Library in record time and pulled in shortly behind my parents (who drove in straight from FL- what luck is that?!). After we parked, we took in the Living Nativity, the singing and the Library decorations. Then, we took the shuttle back to the dining hall and enjoyed our meal. Even though Lil' Miss was a bit wound up, she managed to pack away some ham and mashed potatoes (and one measly carrot)! Katy was slightly disappointed to find not one chocolate offering on the dessert menu (We tried to tell her that the red velvet cupcake was just a chocolate cupcake dressed up for Christmas, but she wasn't buying it! She later told me that she didn't like the "Christmas chocolate."). Nonetheless, the rest of the adults found the meal- and desserts- delicious!